OCHI's dress is inspired by works of French post-impressionist artist Paul Gauguin and the clothing worn by his wife in the painting Merahi metua no Tehamana - designer Iana Kuznetsova says it represents freedom and the image of a "modern day Tehura." 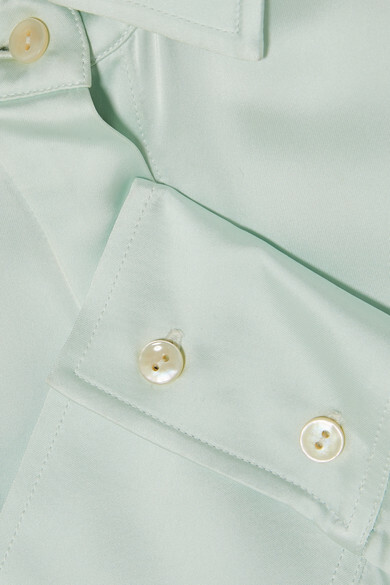 It's cut from lustrous pale-green satin in a billowing oversized silhouette and has extra long cuffs. When you aren't wearing it in the traditional way, the brand suggests styling it as a shirt over pants. Shown here with: BY FAR Shoulder bag, Ellery Sandals, Alighieri Earrings.